In trading I look at high probability setups rather than certainties which is the best tool and that makes trading profitable. Remember technical analysis – indicators are lagging; it’s all based on history. Hence I have kept my method short & simple and wish you every possible success. 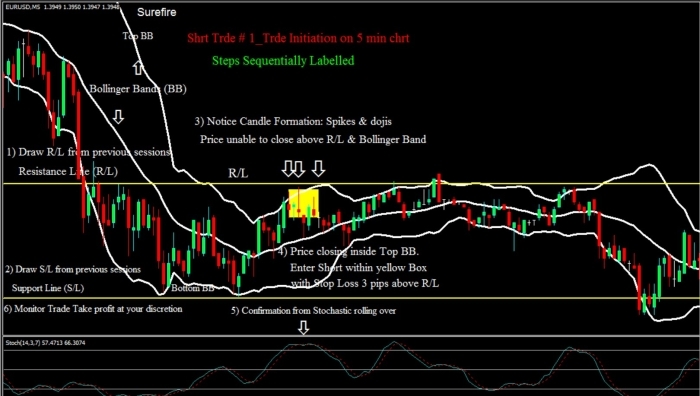 The chart is set at candlestick view; Bollinger Bands are inserted with parameters set to: period as 20, shift as zero and deviation to 2. Stochastic is also inserted with the following inputs: KPeriod = 14, DPeriod = 3 and Slowing = 7. 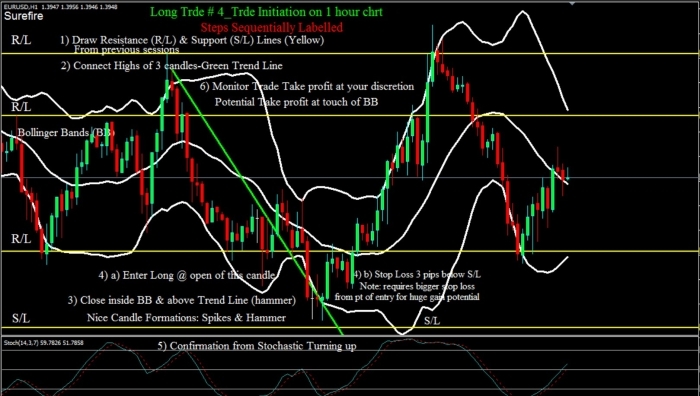 Support Line (S/L) and Resistance Line (R/L) are drawn on the candlestick chart by looking at the previous sessions. When price breaks or fails through the S/L or R/L a high probability setup area is signalled. A trend line is also drawn if one exists and when the price breaks and closes outside the trend line a high probability setup area is signalled. 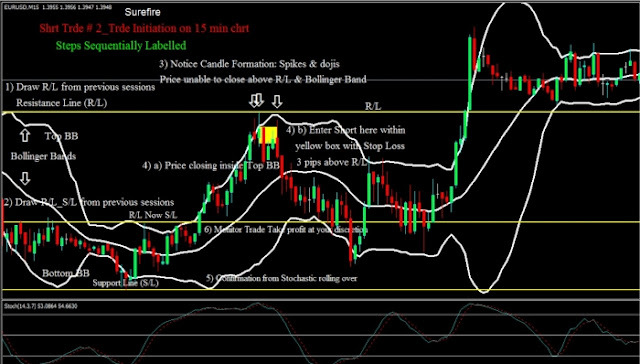 When price breaks; fails or closes inside of the Bollinger Bands (BB) a high probability setup area is signalled. Now let’s look at some example setups that demonstrate high probability entries. On the above EUR/USD 5 min chart the shaded yellow area is a setup where price touches and closes inside the Top BB and also below the Resistance Line (R/L). 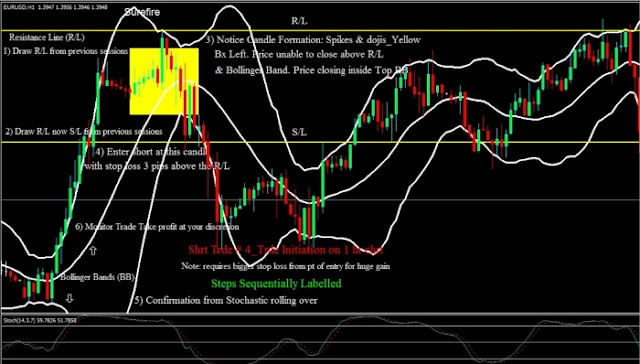 A short trade is entered within the yellow box with a stop loss 3 pips above the R/L. Profit is taken when price touches the bottom BB. On the above EUR/USD 15min chart the shaded yellow area is a setup where price touches and closes inside the Top BB and also below the Resistance Line (R/L). Additionally the Doji candles followed by a bearish candle telling us that the price wants to go down. 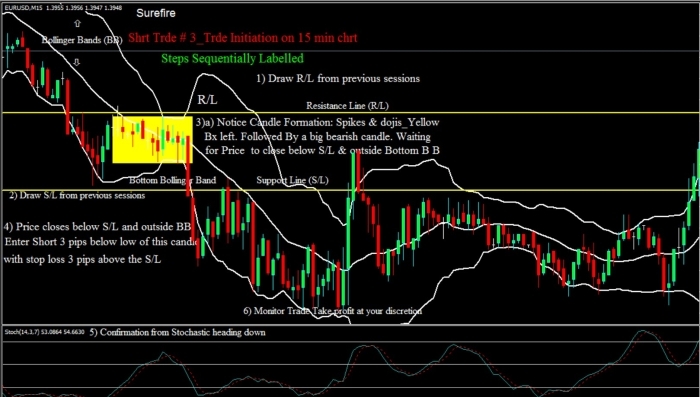 A short trade is entered within the yellow box with a stop loss 3 pips above the R/L. Profit is taken when price touches the bottom BB. On this 15 min EUR/USD chart shaded yellow area the market is been side ways for well over 3 hours. We have R/L & S/L drawn from previous sessions, as it is difficult to say which way the market will move we therefore wait for the price to break either the R/L to go long or the S/L to go short. Sure enough the price breaks and closes below the S/L and outside the bottom BB; the big red candle. Hence we enter a short trade 3 pip below the close of this candle with a stop loss 3 pips above previous S/L now R/L. Monitor the trade and take profit when the price closes inside the BB. On this 1hour EUR/USD chart shaded yellow area price touches top BB also area of resistance denoted by the R/L line drawn from prior sessions. Price starts to back off slowly; closing inside the top BB. Enter short at the 3rd candle after the touch of the Top BB with a stop loss 3 pips above the R/L. Take note the stop loss is bigger from point of entry for a potential huge gain, since this trade is on an hourly chart you must allow enough room for price movement that you don’t get stopped out and then price reverses & continues back in the original direction. 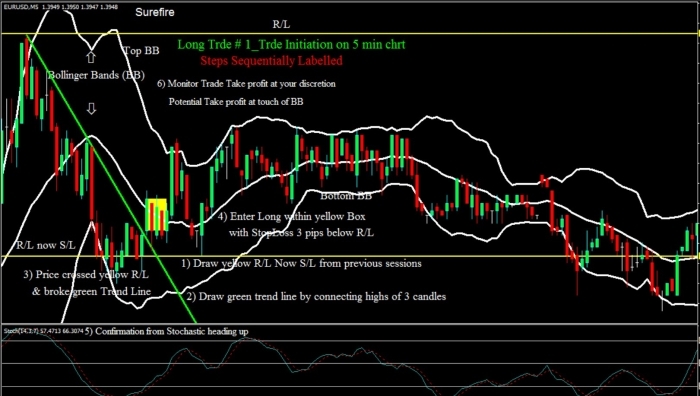 Monitor the trade: You may trail stop loss the trade by moving the stop loss once in the money after the close of the 1 hour candle. 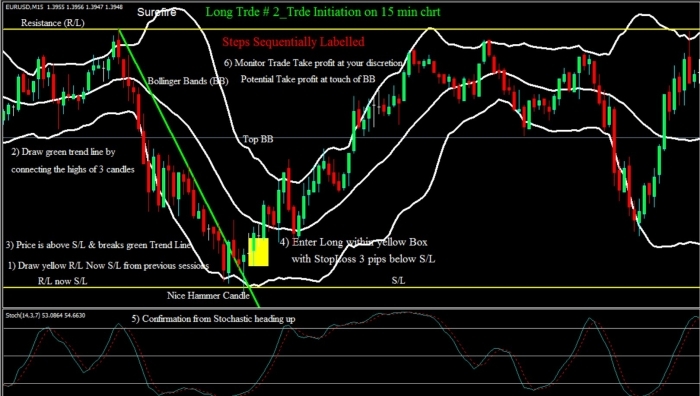 The stop loss would be moved a few pips above the high of the previous bar and subsequently trailed in the same manner until stopped out or take profit at touch or close inside of the bottom BB. 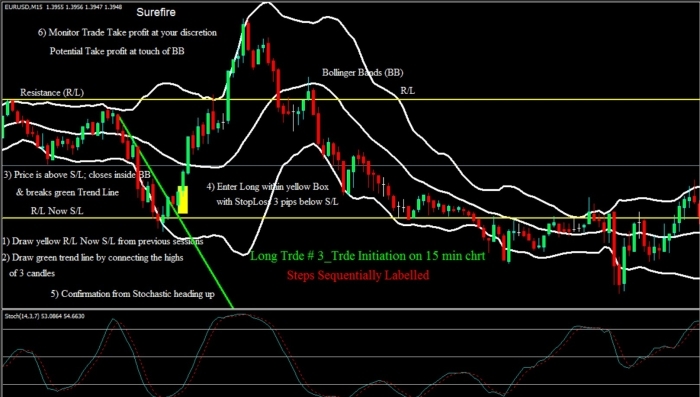 At point of order entry stochastic is turning down & is used to further confirm that price could head further lower. As we notice on the above EUR/USD 5 min chart price has broken & closed above the green trend line. The price is also above the recent Resistance Line (R/L) which now becomes Support line (S/L). Enter long at the best possible price within the yellow box with a stop loss 3 pips below the now S/L. Monitor the trade: Profit is taken when price reach’s the top BB. 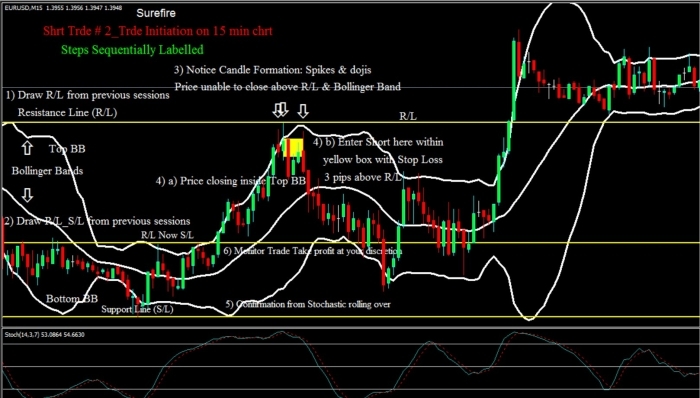 As we notice on the above EUR/USD 15 minchart price bounced off the S/L; has broken & closed above the green trend line and also closed inside the bottom BB as denoted by the hammer candle with a long spike. As we notice on the above EUR/USD 15 min chart price has broken & closed above the green trend line. The price is also above the Resistance Line (R/L) drawn from previous sessions which now has become Support Line (S/L). Stochastic is used to further confirm that price has not reached over bought and still has lots of room to run up. On this 1hour EUR/USD chart price has broken & closed above the green trend line and also closed inside the bottom BB as denoted by the hammer candle with a long spike.